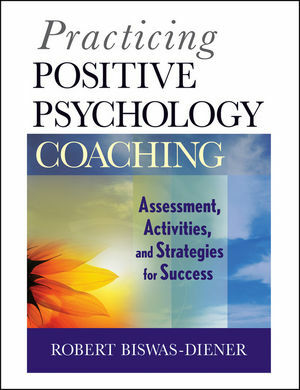 Written by Robert Biswas-Diener, a respected researcher, psychologist, life and organizational coach, and expert in positive psychology, Practicing Positive Psychology Coaching presents a wide range of practical interventions and tools you can put to use right away in your coaching practice. Filled with reflective exercises for use in your own personal and professional development, Practicing Positive Psychology Coaching also includes guidance and recommendations for marketing a positive psychology coaching practice. Dr. Robert Biswas-Diener is known as the "Indiana Jones of positive psychology," becuase his studies on strengths and happiness have taken him to such far-flung destinations as Greenland, Spain, Kenya, Israel, and India. He is the coauthor, with Ben Dean, of Positive Psychology Coaching: Putting the Science of Happiness to Work for Your Clients (published by Wiley) and, with his father, Ed Diener, of Happiness: Unlocking the Mysteries of Psychological Wealth, (published by Wiley-Blackwell). In 2005 Dr. Biswas-Diener founded Positive Psychology Services, LLC, a training and coaching consultancy. He and his colleagues train thousands of professionals in approximately 15 countries annually. 1 Education to Empowerment: An Introduction to Applying Positive Psychology Coaching. 2 Using Your Best to Make You Better. 4 Making Molehills out of Mountains: Coaching Goals and Hope for the Future. 7 Gray Hairs and Gravestones: Positive Psychology Coaching Across the Lifespan. 8 The Practice of Positive Psychology Coaching.